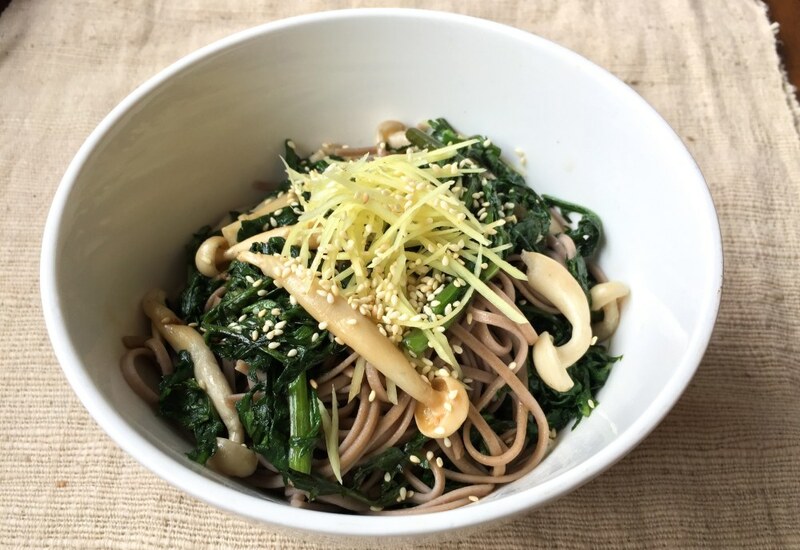 Soba noodles are made with buckwheat and traditionally served in a light dashi broth. You can eat this savory, vegan version hot or cold. This simple Japanese noodle dish includes fragrant chrysanthemum leaves and earthy shimeji mushrooms, tossed with a light dressing made with soy sauce, sesame oil, and rice vinegar. It's a great make-ahead lunch, or easy weeknight dinner thanks to prep and cooking time coming in under 30 minutes. Topping the noodles with julienned fresh ginger adds warmth and a bit of heat. Try pickled ginger for more acidic flavor. Crysanthemum leaves and shimeji mushrooms are available at specialty and Asian markets. If you can't find chrysanthemum, use spinach, watercress, or bok choy instead. Fresh shiitakes are a good substitute for the shimeji mushrooms. The noodles can be made up to three days ahead. Per Serving: 246 calories; 14g fat; 25.6g carbohydrates; 8g protein; 0mg cholesterol; 1210mg sodium. I wanted to make a really cool, special Asian dish. Couldn't find the leaves, so used bok choy as the tip suggests. I found the mushrooms at my local farmer's market. Delicious. Will make again and maybe add chicken. I couldn't find shimeji or chrysanthemum which was a bummer so I used spinach and shiitake instead. I really like cold soba, and I enjoyed this dish overall. The soy sauce and sesame oil mixture was yummy, and added good flavor. I overcooked this chrysanthemum greens on accident and they turned out slightly mushy. Still, I loved the classic Japanese flavors. Shimeji mushrooms are very delicious, so I'm disappointed that I wasn't able to find them at my store. I made this ahead of time to take for lunch the next day. I also used shiitakes, my favorite. Super savory and good when you warm it up too. I used spinach and shiitakes with the cold soba noodles for my weekly meal prep. It was pretty tasty, glad I tried it out. Next time I'm going to try to find an Asian market so I can get Chrysanthemum and Shimeji.